Do you have one of those entertainment areas that need help. Need organization, and simplification. We sure did. A few months ago my hubby got a new fancy flat screen TV. So in the process we rearranged the family room. We put the new flat screen above the mantel which is nice that it keeps it away from little fingers but all the other components were stacked up there along side it. We love the new TV but hated the mess that it brought just having everything right there. We had plans to build a simple shelf to hold it all and be able to still look nice. 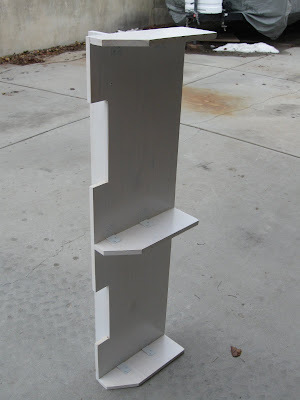 Erek took this project on and together we brainstormed what would work best for us. Since Erek is very much a man of action he we taking it all apart before I could even take a picture so there isn't any before pictures but we did get a few of the project as we were painting it. We purchased a piece of wood for $22, it was enough to all parts the main shelf and legs. We also purchased some screws and paint. Total project about $35. Here is a close up of it up on the mantel. I like the it is a very simple design and doesn't take way from the design of the mantel or the decor of the room. 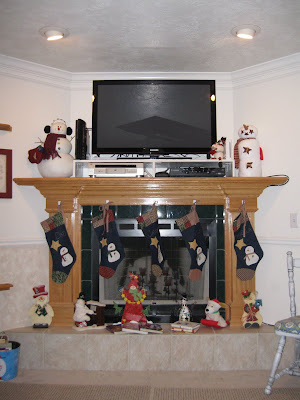 Finally, the finished project with all the Christmas decor on the mantel.